Even the most skilled sorceress can't ward off a lawsuit, and Lily is not at her enchanting best with her hands full as the temporary leader of San Francisco's magical community. So after her potbellied pig Oscar head-butts rival clothier Autumn Jennings, Lily tries to make peace without a costly personal injury case. But any hope of a quiet resolution is shattered when Autumn turns up dead. 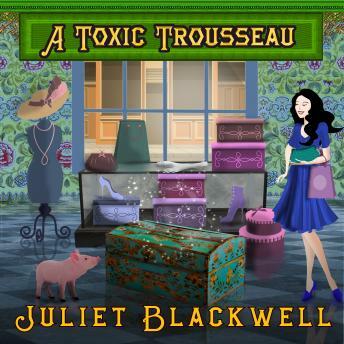 As one of the prime suspects, Lily searches for a way to clear her name and discovers a cursed trousseau among Autumn's recently acquired inventory. Lily must deal with a mysterious dog walker and spend the night in a haunted house as she delves into the trunk's treacherous past. She's got to figure out who wanted to harm Autumn fast, before the curse claims another victim. I really enjoyed this book as well as the others! The narrator was excellent I'm glad they use the same one. Looking forward to the next one!